Don't settle for store-bought bat wings when you can sparkle and shine with your own fabulous handcrafted wings. Easy to make bat wings are inexpensive and can be completed, start to finish, in less than an hour. They don't require sewing. The handmade bat wings can be worn with commercial costumes, leggings and a T-shirt, or your own costume creation. Make a wing pattern. Draw a bat wing on a white sheet of poster board. 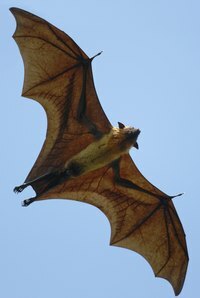 The easiest bat wing is made with a large dip in the top of the wing, and three arches in the underside. Make sure the side of the wing curves back toward the center of the wing. Cut out the bat wing. Trace the bat wing outline onto the two black poster boards with the white crayon. Cut the wings out and set them aside. Fold the sequined fabric in half and lay it on a flat surface. Pin the wing pattern onto the sequined fabric, and cut it out. Set the fabric aside. Punch three holes into the center section of each wings. The top and bottom holes on each side are for the shoulder straps. Preheat the iron to the cotton setting. Add cellophane to the underside of the wings to create texture. Cut strips of cellophane from the roll, and lay them over the poster board wings. Place wax paper over the top of the cellophane and iron the cellophane to the poster board. Trim excess paper from the edges if necessary. Overlap the wings and connect them with a brad in the center hole. Measure the length of your arm. Use that measurement to create the shoulder straps. Cut two pieces of leather cord to that measurement. Insert one end of the leather cord through the top hole of one wing section. Tie a knot in the end. Insert the other end of the leather cord through the bottom hole, and tie the end of the cord in a knot. Repeat on the other wing. Spray glue adhesive onto the back of the bat wings. Carefully lay the sequined fabric onto the bat wings, and rub the fabric flat to prevent creases. Fun Halloween crafts! Learn how to make flapping bat wings with a straw in this free video clip about Halloween ideas.